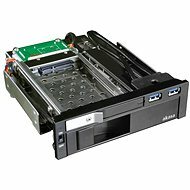 A very practical computer case frame that will allow you to conveniently install a 3.5" Serial ATA hard drive without using screws or any other unnecessary wirings and utilize the complete power of the installed disk. Just install it in the cubicle, the rest of it will be taken care by the HotSwap technology, which allows you to connect your drive while your computer is running. This frame does not have a shaft into which you would first have to screw in the disk, a technology which has often been criticized for having an old frame property. In this case, you insert the hard drive directly. The disc is protected against overheating by a fan and can be locked against the key ejection. For shipping to other EU countries visit this page ICY DOCK MB-877EN-B. Für Versand nach Deutschland, besuchen Sie bitte ICY DOCK MB-877SK-B. Chcete doručit zboží do Česka? 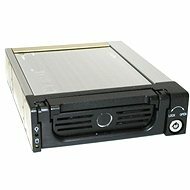 Prohlédněte si ICY DOCK MB-877SK-B. Chcete doručiť tovar na Slovensko? 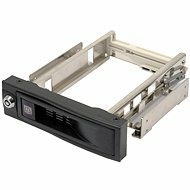 Prezrite si ICY DOCK MB-877SK-B. Für Versand nach Österreich, besuchen Sie bitte ICY DOCK MB-877SK-B. Magyarországra történő kiszállításért tekintse meg ezt a termékoldalt: ICY DOCK MB-877SK-B.